Police searching for a man who has not been seen for more than two weeks are asking the public to check outbuildings and gardens for any trace of him. Brian McGowan, 42, was last seen in the Gillespie Terrace area of Plean, near Stirling, at 16:00 on 21 September. Investigations have uncovered a "probable" sighting of him in the Gallamuir Drive area at 01:30 the following day. Police said that since then he has not returned home or contacted anyone. 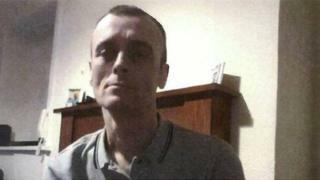 Insp Donna Bryans said: "Brian has now been missing for two weeks and it is vital that we find him. "I would like to thank the local community who have come out to search for Brian and helped with our investigations so far. "I would ask residents and visitors to Plean, as well as visitors to Plean Country Park, to be vigilant and report any sighting of anyone seen matching Brian's description." Insp Bryans said a search of gardens and outbuildings in the area could help officers discover Mr McGowan's whereabouts. He is described as 5ft 10 tall, of slim build with short dark hair. He had blue eyes and tattoos on his fingers and speaks with a local accent. When last seen he was wearing a black baseball cap, a black G-Star jacket, grey Armani jumper, grey Adidas tracksuit bottoms with black stripes on the sides and black and grey Adidas Y3 trainers.